Myrrh is a famous plant substance with roots in biblical times, but it has a not-so-famous cousin called Opopanax. Opopanax (Commiphora guidottii), or sweet myrrh, is probably the variety mentioned in the Song of Solomon. It has a sweeter, softer scent than its relative which is sharper smelling. 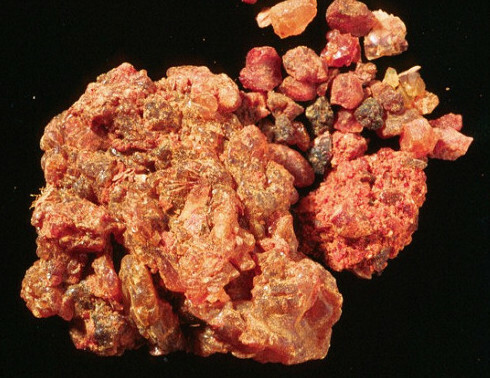 In the past the resin would have been burned as incense to release the aroma, but we have learned to make an essential oil from these golden-red colored chunks. The rich and earthy perfume of Opopanax has been used throughout history as a base note. It is considered a fixative because it “fixes” or holds lighter scents in a blend so they evaporate more slowly. This offers a nod to its use in ceremonies as a grounding fragrance that assists in meditation and prayer. It is believed to increase awareness and intuition and is used in spiritual practices, which is especially timely as we approach a new year. The therapeutic uses of Opopanax essential oil are similar to Myrrh (Commiphora myrrha) essential oil. Like other resins, they are helpful in supporting skin health, especially dry skin and with eczema. In cases of respiratory illness, they can help loosen and remove excess mucus. As antispasmodics they relieve spasms, cramps, and sore muscles. Opopanax can reduce anxiety and its pleasant odor can help soothe an overactive mind so you can drift off to sleep.